Local Trade Copier – a special software for MetaTrader 4 platform which helps retail Forex traders share trades with their friends and family without the need to open highly regulated PAMM accounts. Special thanks to all the traders that are using my MT4 trade copier to copy trades between multiple MetaTrader terminals. I’ve received so much feedback from you, which helps me improve LTC software month after month. Hundreds of retail traders and account managers already use LTC to manage millions of dollars since 2010. 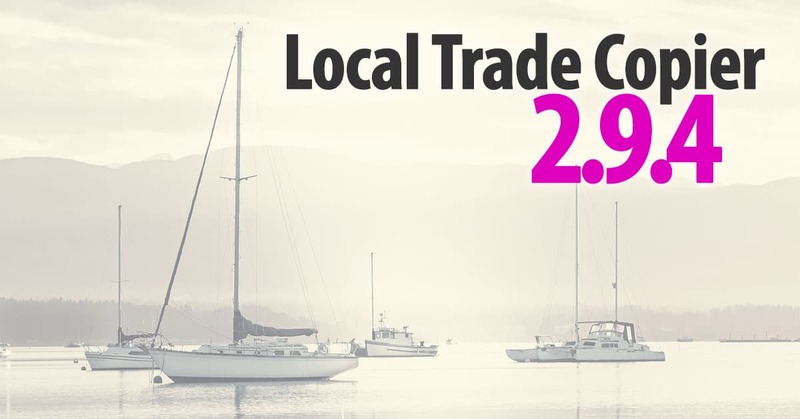 Now let’s take a look what has changed in the LTC v2.9.4. I’ve added new cool features and fixed a few bugs. Let’s take a closer look. Authorization was improved in the new LTC copier. To make it more simple for you and reduce your computer/VPS server load, only Server EA does the authorization. This means from now on you start Client EA without even entering “License Key”. You will only need to enter “License Key” for the Server EA. For Client EA, simply always leave “Licence Key” empty. 2) Authorization is now even more secure. Authorization happens through a highly secure HTTPS connection. This makes it nearly impossible to hack and steal any information. 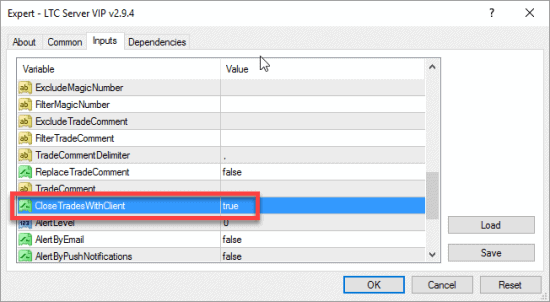 You can build Offline License Key (OLK) file on your computer(s) or VPS server(s). This means you will be able to launch the software without using the License Key and even if the authorization web server is offline. Important to understand that once OLK is created you will no longer be able to transfer it to another computer until it expires. That’s why you can choose for how many months you want your OLK to be valid. You can renew OLK any time even after it expires. Once OLK expires you will be able to transfer the license to another computer. OLK is locked to your computer’s hardware fingerprint which is generated using MAC address and a few other computer parameters. If your machine has several MAC addresses OLK should remain valid if one of them is changed. Offline License Key (OLK) created for the Local Trade Copier. This LTC activation will not need online authorization for 12 months now. Offline license activation is available for VIP and CORPORATE licenses and only when you have a lifetime plan. This option is not available for monthly payment plans. Note that you can only create OLK for 1 month if your refund period is not over yet. After the refund period is over (usually 60 days from the purchase date) you will be able to create OLK for a longer time. 4) Enter “License Key” only one time on the same computer. You no longer need to enter “License Key” every time you attach LTC copier EA to the chart of your MT4 terminals. If EA authorizes successfully at least once, other EA instances won’t need “License Key” at all on startup on the same computer even on different MT4 terminals. This allows you to start EA even faster. 5) Delay or Ignore trades when limit reached. 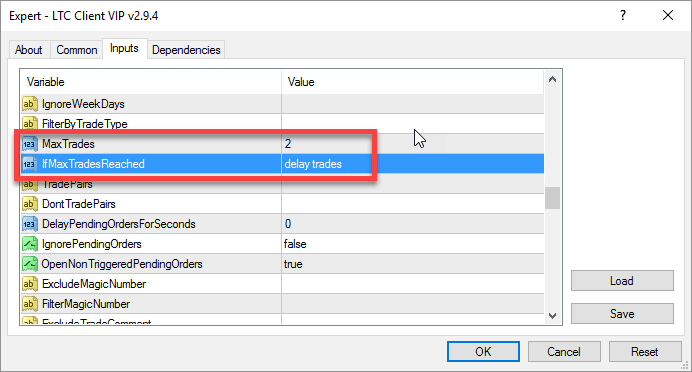 Client EA can be set to delay or ignore trades when a maximum number of orders is reached (MaxTrades). Previously all trades were ignored, but now, Client EA can be set to delay trades if there’s no more room for new trades. Forex trade copier set to delay copying of any new trades if there are 2 open trades currently running on the client account. Say you set MaxTrades=2 and EA is set to delay trades if the limit is reached. In this case, EA will not copy any new trades from the master account if there are 2 trades already running on the client account. But once any of those two trades gets closed the Client EA will copy the next trade waiting in line that still exists on the master account. In case the trade, that was delayed, is closed on master account it won’t get copied to the client after there is enough room. Two-way communication created, which means master account can close the trade when the related trade gets closed on the client account. Imagine you have a trade #123 on the master account and the same trade copied to 3x client accounts. With this new option, you can set the Server EA to close the trade #123 immediately after it closes on any of those 3 client accounts. For example, the trade hits SL/TP or is closed manually on the client #2. Immediately its parent trade #123 will be closed on the master account and this will make other client accounts (account #1 and #3) close related trade too. For this to work, you need to turn on this option on the Server EA and the Client EA. On the Server EA, you need to set the CloseTradesWithClient to TRUE. This means that even if you have multiple master accounts you have full control with master should have this option turned on. LTC Server EA is set to close trades with the client. 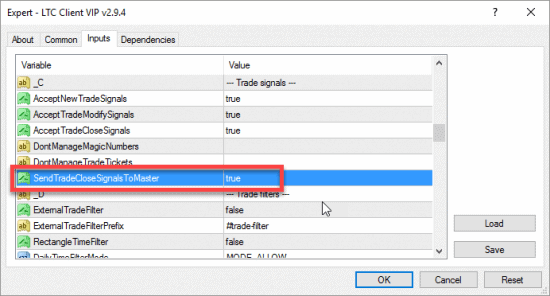 Also, on the Client EA, you need to set the SendTradeCloseSignalsToMaster to TRUE. This means you have full control which Client EA must send close signals to the master account. LTC Client EA is set to send trade close signals to the master account. 7) Trade copier Speed displayed on the screen. Trade copier EA now shows the speed of data exchange, trade list check, order execution and full synchronization time. This helps you to understand where and why your copied might be slow. The “Data exchange” speed tells you how fast the trade copier is to read the information from the disk. If it takes a lot of time to read the information it means your computer is overloaded or is too slow. This is usually slow if you have hundreds of trades open. To improve the speed of data exchange use computer with SSD disk or run less MT4 terminals. The “Trade list check” speed tells you how fast the trade copier is to go through the list of all open trades and pending orders on MT4 account, compare it with the trade list from the master account (information that was read in “Data exchange” step) and apply all changes (open new trades, modify existing trades, close old trades) to the trade list on the client account. This also includes execution time for each transaction. If it takes a lot of time to check the trade list it means your Internet connection is poor or your computer is overloaded or too slow. This can naturally be slow if you have hundreds of trades open because MT4 allows EA to check only one trade at a time. To improve the speed of trade list check improve Internet connection, run less MT4 terminals or use a better computer with more RAM memory or more CPU’s. 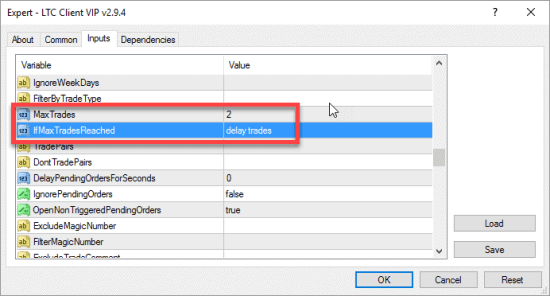 The “Trade execution” speed tells you how fast trade copier can open, modify or close trades. Each transaction counts. If any or few of the transactions will be delayed by your Internet connection or your broker this might take even more time. If the execution time is high it means your Internet connection is poor, or your broker is delaying transactions on purpose, or your computer is overloaded or too slow. This can naturally be slow if EA needs to perform hundreds of transactions because MT4 allows EA to do only one transaction at a time. For example, if Client EA has to copy 10 new trades, modify 5 currently open trades and close 15 old trades, it means Client EA needs to perform 10+5+15 = 30 transactions total. If your Internet connection is good (consider 50 ms or less) and your broker execution speed is around 100 ms, then it will take approx. 3 seconds (30 x 100 ms = 3000 ms) to complete these transactions. Imagine if your trading algorithm opens 100 trades and before that closes old 100 trades. Considering that each trade also has SL/TP it gets applied to already open trade and counts as an additional transaction. This means it would result in 100 (open) + 100 (apply SL/TP) + 100 (close) = 300 transactions. With 100 ms execution speed, it will take 30 seconds. And if you happen to get the execution speed of say 10 ms with the broker (quite hard to do) it will still take at least 3 seconds. To improve the trade execution speed improve Internet connection, run less MT4 terminals or use a better computer with more RAM memory or more CPU’s. If you find out your broker is delaying transactions on purpose (I’ve seen this with my own eyes with Admiral Markets) then consider moving to another broker. As you can see, the trade copier has not much to do with the trade copy speed. 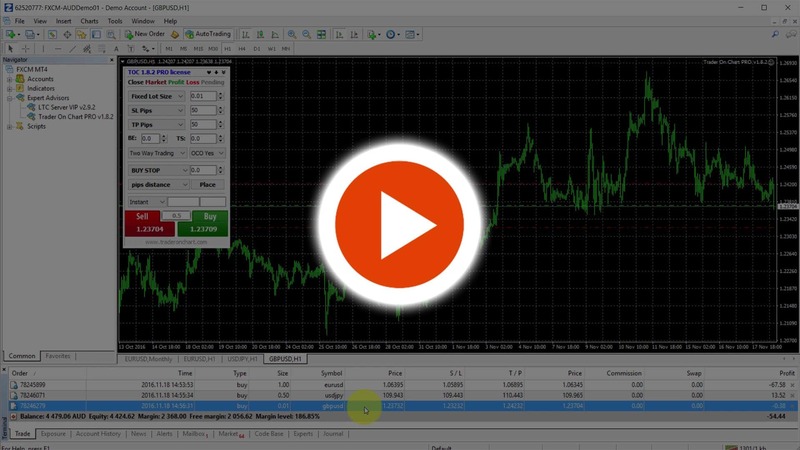 Here’s the video showing how fast my Forex trade copier is. But in case the Forex trade copier work slowly for you check out this guide on how to improve MT4 speed. The “Full synchronization” speed includes all three values. This is data exchange + trade list check + execution speed. If this value is high you should be looking closer into other speed values to identify where the problem is. Local Trade Copier helps retail Forex traders and account managers copy trading actions from one MT4 account to another on the same computer. This means you won’t need to repeat the same trading actions on each MT4 platform individually. Thanks for the continued support, Rimantas. I am impressed by your video on copying 10 orders in 1 second. I want to use free in 7 days. what i need is speed. Can you send me a trial? I do not offer trial option, but you can rent software for a small monthly fee. If you don’t like it you can refund in 60 days. My mt4 acounding is trading by my fund maneger if i use your local trade copier.my fundmaneger or my broker know that i am using local trade copier? Ravi, no one will know you are using trade copier if you won’t tell them and you won’t show them.